This past October we took our first trip to Fiji. Our friends and I have always wanted to travel to this exotic destination. In the surfers world it’s known for heavy, excellent surf, and crystal clear water. 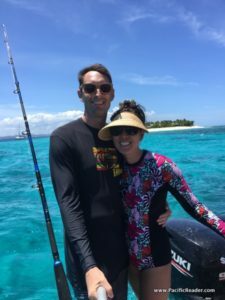 Since we were traveling with Cruz and most of our friends who don’t surf we decided to charter a boat for the day that would take us between Tavarua and Namotu islands. This way we could surf, snorkel, and have lunch on the boat as a group. We decided to leave Cruz back on dry land with our house rental’s Fijian nanny. We chartered a boat with Fiji Surf Company who also supplied surf boards for Steve, Brandon, and I. 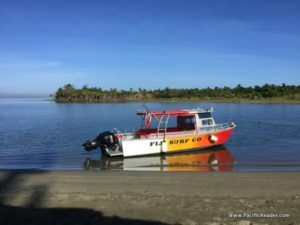 The Fiji Surf Company guide and boat driver was very friendly and accommodating. 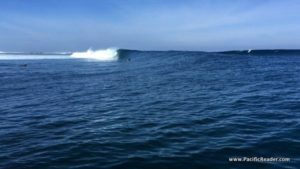 We checked several surf breaks around Tavarua and Namotu. As luck had it, it was a perfect day of medium size surf, light winds, and sunny weather for our boat day trip. 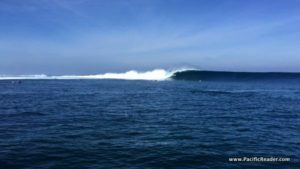 The infamous surf break Cloudbreak was packed and going off! It was a little overhead on the sets and heavy! Guys were getting barrels and others were wiping out! We watched several sets from the boat and decided to pass and not fight the gnarly crowd or end up in the hospital. We found another break nearby about 5 minutes away that was just about head high on the sets and only a handful of surfers out. I had one of the best surf sessions of my life catching about 20 long, clean, amazing rides!! I paddled until my arms were exhausted. We had lunch back on the boat and just soaked up all the beauty of the day.